FOR SENSITIVE SKIN ON THE GO – Our gynecologist-approved healthy alternative to feminine care is free of chemicals, parabens, carcinogens, and sulfates to make sure that even the most sensitive skin can enjoy comfort while you enjoy peace of mind. 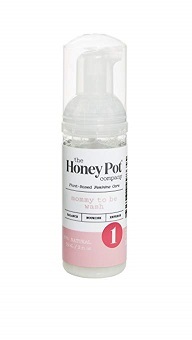 Our hygiene wash is the perfect product for any mom-to-be, and at 2oz. it can go anywhere you go. You deserve wellbeing. You deserve natural. You deserve The Honey Pot. ALL NATURAL – Through a functional plant-based feminine care system, our travel 2oz. mommy-to-be hygiene wash is made completely free of toxic, chemical-laden ingredients – because you want feminine health and wellness even when you’re far from home. Bounce back from childbirth with the help of healthy healing herbs and rich botanicals.